A spacious and light apartment, on the outskirts of Los Gigantes. 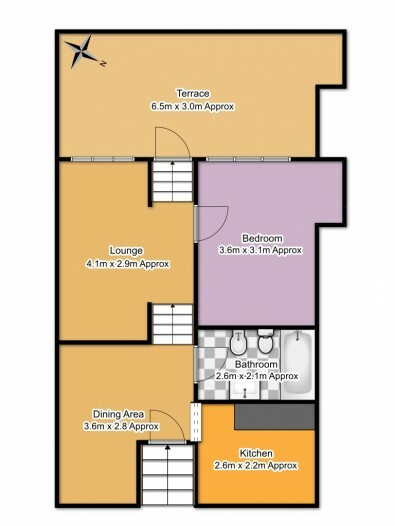 This split level property consists of one large double bedroom and a full bathroom. There is a separate kitchen and dining area. On the higher level is an open living room, leading through patio doors on to the sunny terrace of 20 sq m. From the terrace there are spectacular, unforgettable views to the ocean and the famous cliffs of Los Gigantes. This apartment is sold furnished and has a lift for easy access. The location is perfect only a short walk into Puerto de Santiago and Los Gigantes, where shops, restaurants and other local amenities are easily reached. Close by to the public bus routes and ready available taxi's. A great investment property at a great price.